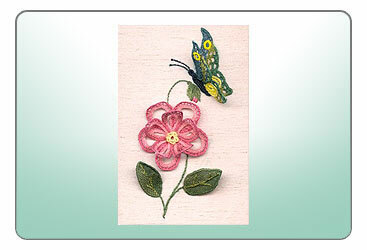 Doreen's kits are Stumpwork, Embroidery, Cross Stitch and Reproduction Sampler kits. The Stumpwork kits are worked in the traditional way using a mixture of long and short stitch plus needlelace techniques. If you look at 'old' pieces of stumpwork you will see these different techniques. Another name for Stumpwork is Raised Embroidery and embroidery/needlelace techniques were used in the antique pieces. 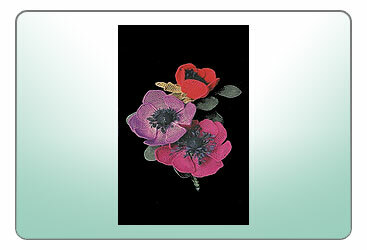 All of the kits on this website are designed and worked by Doreen. She produces kits under two different labels - some are for Pearsall's - a silk manufacturer based in Taunton, and some are produced under Doreen's own label - Leisure Needle.